Diamonds are widely used in engagement rings or anniversary rings for women, but did you know that men are wearing diamonds with increasing popularity? Our 950-platinum channel-set diamond wedding ring features a splendid channel setting to add a touch of vivacity and charm to your everyday look. With 18 round diamonds set in groups of three, your ring will continue to dazzle you and onlookers from every angle. Although many contemporary couples are opting for alternative metals, we wanted to provide a modern twist on a classic by offering a gorgeous platinum ring with a comfort-fit band, designed to suit a myriad of styles and personalities. With our 6mm men’s 950-platinum channel-set diamond wedding ring, your smile won’t be the only radiant thing at the altar. Discover the power of diamonds and the lasting quality of platinum by taking a closer look today! The stylish satin finish of our 950-platinum channel-set diamond wedding ring provides the perfect canvas for your diamonds to truly pop. Platinum is a highly desirable metal because it is the purest of the precious metals at an astounding 95% purity. You will also enjoy platinum’s symbolism for endurance. Diamonds, on the other hand, are the perfect symbols for love and prosperity. 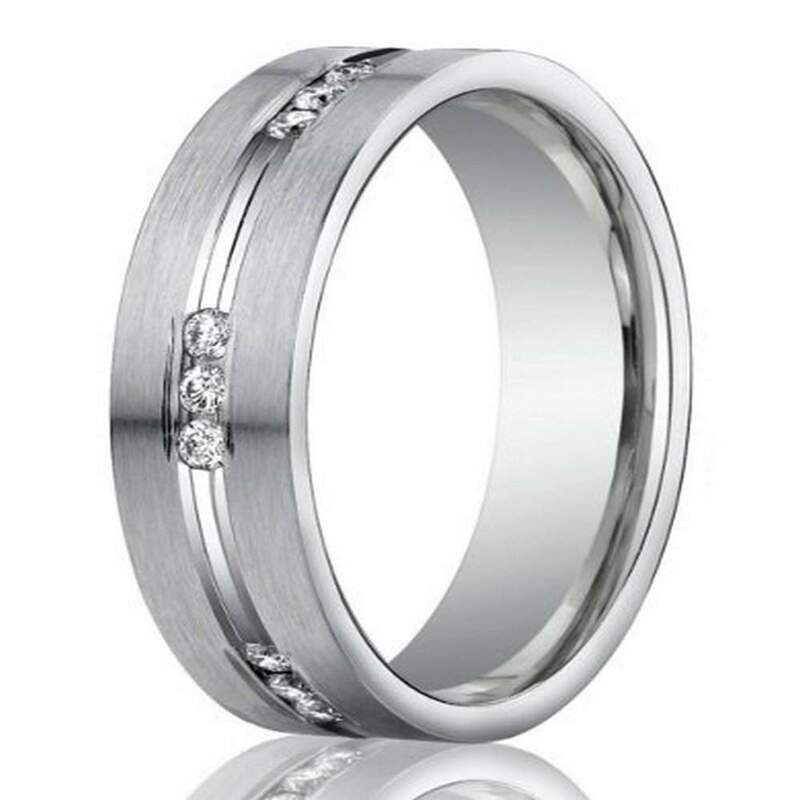 We can think of no better way to commemorate your romantic commitment than by choosing our 6mm men’s 950-platinum channel-set diamond wedding ring. Add a personalized engraving to your ring to enjoy an unforgettable message for the rest of your marriage. Contact us today with any questions or concerns, and a member of our team will gladly assist you.